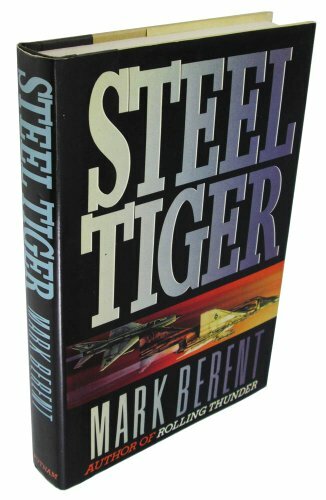 Mark Berent served in the Air Force for more than twenty years, first as an enlisted man and then as an officer and fighter pilot. He has logged over 5,000 hours of flying time, more than 1,000 of them in combat. During his three Vietnam tours, Berent earned not only the Siver Star but also two Distinguished Flying Crosses, twenty-five Air Medals, the Bronze Star, the Legion of Merit, and the Vietnamese Cross of Gallantry. "Steel Tiger" was U.S. Air Force code for the northern panhandle of Laos, a crucial sector of the Ho Chi Minh Trail. This sequel to Rolling Thunder focuses on the efforts of the Air Force in the summer and fall of 1967 to cut the vital supply line. Berent's indictment of the Johnson administration's micro-management of the air war over North Vietnam is well meant but stolidly written; the novel takes fire when he switches from political commentary to military action. The story is told through characters introduced in the earlier novel: fighter pilot Court Bannister, forward air controller Toby Parker and special forces lieutenant colonel Wolf Lochert. Fast-paced accounts of strike missions and fighter combat are juxtaposed with an effective subplot describing North Vietnam's air defenses through the eyes of a Soviet pilot. Berent keeps readers in the cockpit until the final pages, notwithstanding such incongruities as "Thor's balls!" used as a Russian expletive.